Out of 919 Internet users in India in the age group 15-65, 175 (19%) reported that they had online harassment. ONE IN every five Internet users surveyed in India have reported having faced online harassment. This is one of the findings of surveys by the policy think-tank LIRNEAsia on the Global South and information technology; other findings were reported in The Indian Express Wednesday. Out of 919 Internet users in India in the age group 15-65, 175 (19%) reported that they had online harassment. This was more than in Pakistan or Bangladesh (12% each). Rural users in India (20%) experienced more online harassment than urban ones (17%) while males (20%) faced more harassment more than females (17%). Almost half of those who had experienced online harassment in India were called offensive names, while one-fifth were “purposefully embarrassed or criticised in another way” and one-sixth were cyber-stalked, or repeatedly approached by unwanted contacts. Again, 38% of those who faced online harassment did not know the motivation for the harassment, while roughly 20% each believed the motivation to be gender, religion or race, or politics. 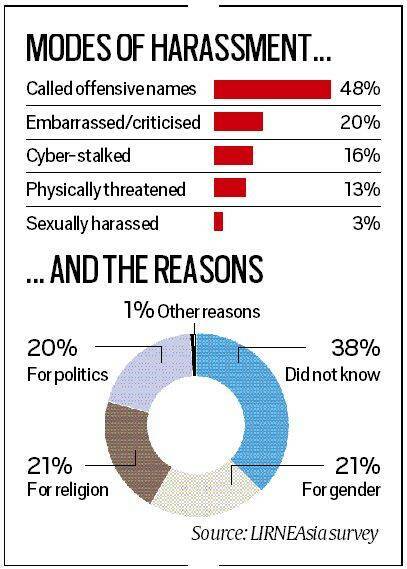 Most experienced the harassment on social media, while 29% faced it on chat applications, 16% on website comment sections and 7% in online gaming. The source of the harassment was split into thirds (33% each) among someone the user had met offline earlier, an online contact never encountered offline, or someone unknown online and offline. For almost half (48%) of those who experienced harassment, the incident(s) had no effect. Some reduced their time on the particular website (28%) while 15% deleted the app altogether. Only 5% unfriended or blocked the contact, or left the group or forum. Mobile money use in India was just 6% of phone owners. On the other hand, awareness and use of e-commerce platforms was higher in India than in Pakistan and Bangladesh for most sectors. That said, e-commerce participants were often not heavy users, and only completed the search or search-and-order process. Of those who did purchase online, 27% used debit cards, 22% used cash on delivery, and 18% used mobile banking or internet banking. Of those who didn’t participate in e-commerce, 31% said they could already buy what they needed offline, 24% were not comfortable sharing personal details and 23% were not certain of the product’s quality. The 919 Internet users represented 19% of a pool of 5,000 Indians surveyed. Among the non-Internet users, 64% said they did not know what the Internet is. This proportion was third-highest among all 16 countries surveyed, below only that in Pakistan (69%) and Bangladesh (67%). Also, 9% of non-users, while aware of the Internet, did not know how to use it. The non-users included 68% female respondents and 68% from rural areas. Three-fourths had either no education or only studied up to primary level. Even among smartphone users, 35% were unaware what the Internet is. At 19%, Internet use in India is lower than that in Nigeria, Ghana, Kenya and Cambodia. Most other surveyed African and Asian countries, however, had lower overall penetration than India.